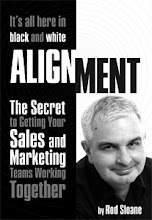 Sales and Marketing Alignment Blog from Rod Sloane: What business are you really in? As Levitt pointed out they were in the transportation business competing with cars, planes and boats. Not each other. So what business are you really in? It probably isn’t the legal business or the printing business or the restaurant business. I’m not even in the marketing business! Here’s a clue. What problems are your clients and prospects attempting to solve coming to you and how else could they solve it…that’s the business that you’re in. Forget about your stuff and solutions, keep focusing on what your clients want to achieve. That’s the business to be in.